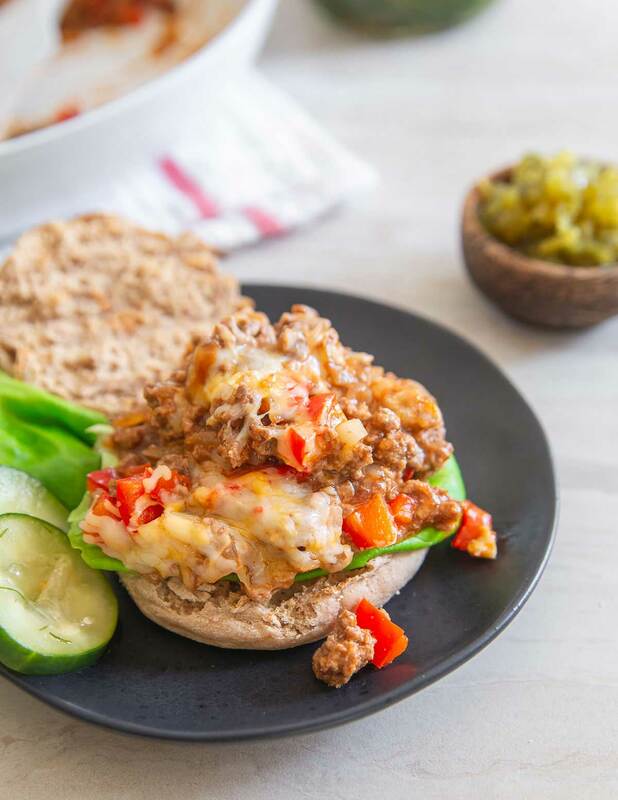 These Healthy Sloppy Joes are made with lean ground beef, low-sugar ketchup and BBQ sauce and low-fat cheese. The indulgent recipe you crave without the guilt. Watch the video below! Can you say sloppy joe in your head without instantly picturing Adam Sandler singing that Lunch lady song about them? Sloppy Joes are quintessential American food, aren’t they? Here’s the funny thing, I never ate a single one growing up. Not one. My mom just didn’t do sloppy joes for some reason. We also didn’t do taco night or chicken nuggets. Breaded chicken cutlets, yes but not chicken nuggets. Pasta was always on our weekly menu but typical “American” food just never made its way into rotation. For a long time I equated sloppy joes to nothing more than a hamburger helper type of meal but when I finally ate a proper sloppy joe years later, I realized that’s not the case. What is a Sloppy Joe? While not always “traditional” I prefer mine with cheese. The whole premise of the sloppy joe is that it’s quick, cheap and easy food. Nothing new when it comes to American cuisine. 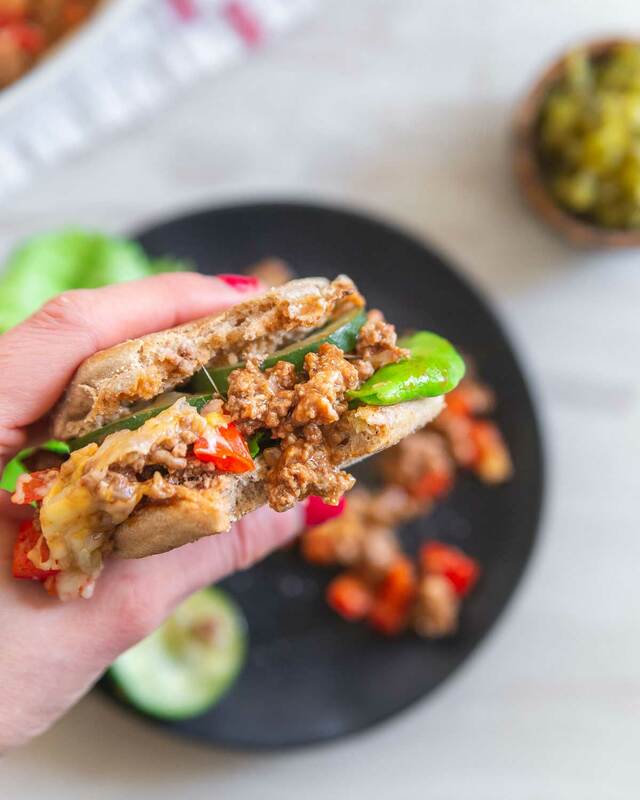 How Do You Make A Sloppy Joe Healthy? 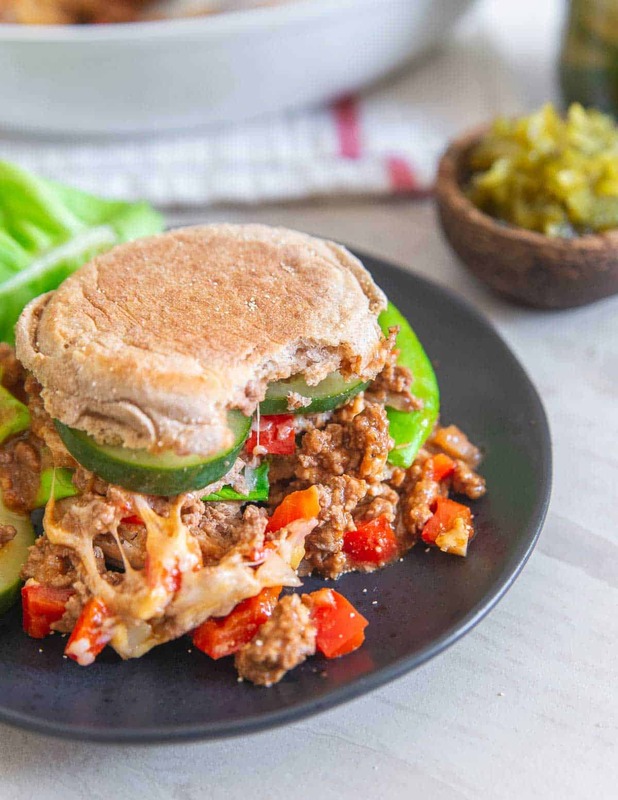 By definition, sloppy joes aren’t really unhealthy but there are definitely a few tweaks you can easily make to the recipe to make a healthy sloppy joe. I love using Trader Joe’s 96/4 lean ground beef but 93/7 or even 90/10 are all good options for lean beef. Of course, you could use ground turkey or chicken as well if you wanted to. Those are usually 92/8 or a 93/7 mix from the store. 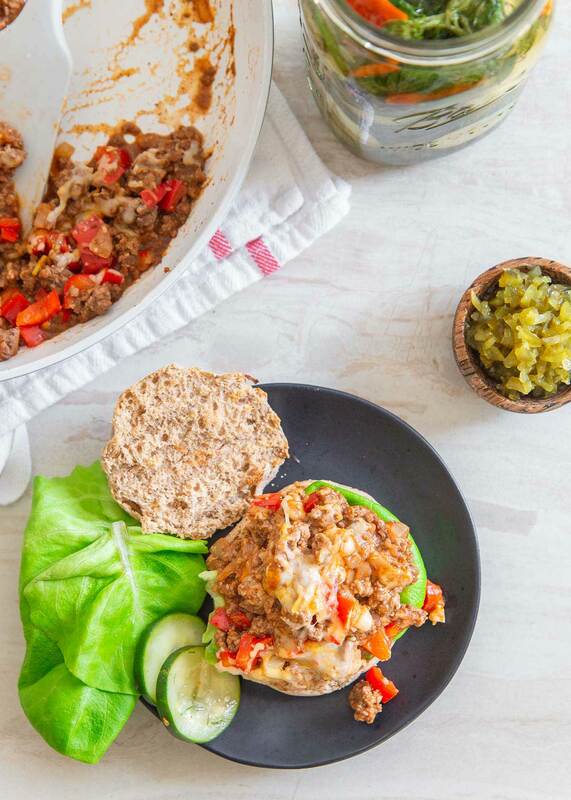 What Seasonings Are In These Healthy Sloppy Joes? The condiments and seasonings are the best part of a sloppy joe in my opinion and what set it apart from being just a ground up burger. While ketchup is traditional, I like to add BBQ sauce to my healthy sloppy joe recipe as well. It brings a little smokiness and you can easily find low-sugar or no sugar added BBQ sauce these days (I personally like the G Hughes brand). The other *key* ingredient to sloppy joe seasoning is the vinegar. I love the tang that the apple cider vinegar brings to this dish. I purposely use apple cider vinegar rather than red wine vinegar because I think it’s a little stronger in flavor which I really like against the ketchup and BBQ sauce. How Do You Serve Sloppy Joes? On a bun of course! 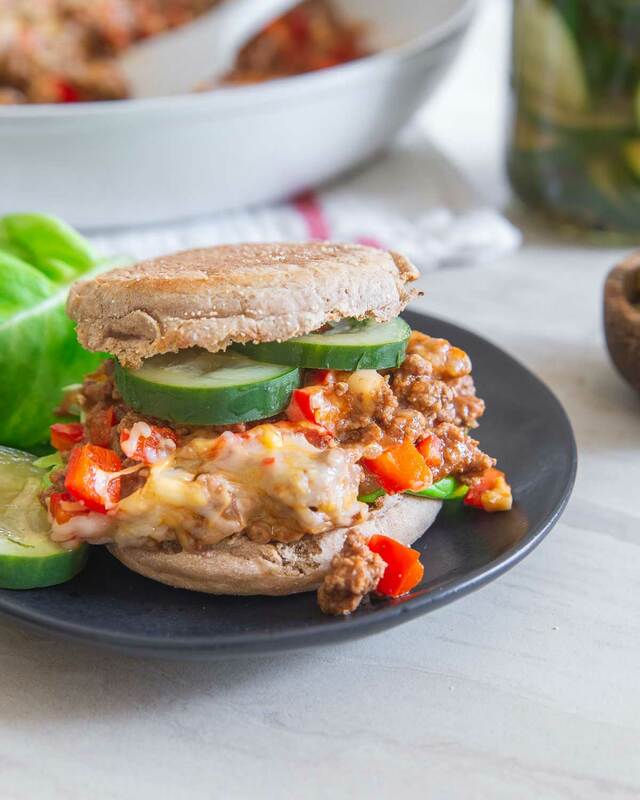 Tradition says sloppy joes are served on hamburger buns but in keeping with the healthier twist to these sloppy joes, I like to use a whole wheat English muffin instead. If you’re looking to keep things gluten-free you could always make your own with this 2 minute paleo English muffin recipe, it’s made right in the microwave! Some lettuce and homemade pickles round things out and if you really love the sweet and tangy thing, try some relish too! There aren’t many classic American meals I can say I truly love but that’s not the case with these healthy sloppy joes. I truly love this recipe. It’s easy, ready in 25 minutes, healthy and an explosion of flavors with each bite. It rivals a good burger for me and mostly because of that sweet and tangy savory flavor. Combine that with the melted cheese and it’s really a hard meal to beat. This sloppy joe mac and cheese looks outrageous too for when you want some major comfort food in your life! Or try these sloppy joe sweet potato fries – it’s like nachos and poutine had a baby in that creation! These healthy sloppy joes are made with lean ground beef, low-sugar ketchup and BBQ sauce and low-fat cheese. The indulgent recipe you crave without the guilt! Once hot, add the beef to the pan and cook for about 3 minutes until browned, breaking up the meat with a spatula as it cooks. Add the onions, red pepper and garlic and continue cooking for another 5 minutes until softened. Add the ketchup, BBQ sauce, Worcestershire sauce, apple cider vinegar and 2 tablespoons of water to the pan. Stir to combine, lower the heat to a simmer and cook for about 7 minutes. If the mixture starts to stick to the pan and gets too dry, add up to an additional 2 tablespoons of water while cooking. 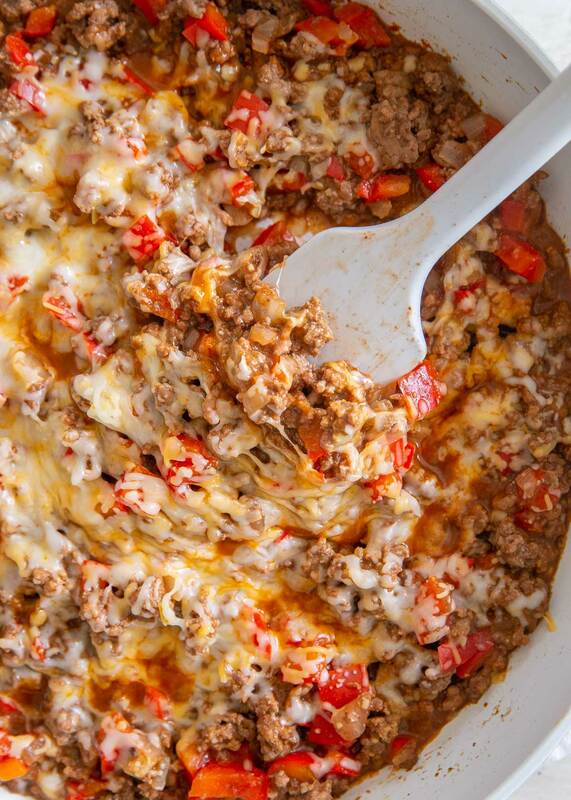 Sprinkle the cheese on top of the meat mixture in the skillet. Cover with a lid for 2 minutes until melted. Serve with toasted english muffins, lettuce and pickles. Such a delicious way to make one of my childhood favorites healthier! Thanks for the recipe! I have to tell you – I am teaching myself how to cook (I don’t know how!) and of all the recipes on the internet, I chose this one to be my first. I hope you feel special because I looked at a million of them. Well, I am happy to report that I made sloppy joes today and they were absolutely amazing!! Your recipe was very easy to follow, quick, and so delicious. I’ve already eaten two (BTW for lack of any better options at the store, I ended up using Sticky Fingers BBQ and it tastes incredible). Thanks for making my first cooking experience a huge success. I cannot wait to try again and will be checking out your other recipes!